An increasing number of couples are opting for prenuptial agreements (prenups) before they get married. According to the Wall Street Journal, 63 percent of surveyed divorce professionals said they’d seen a marked increase the use of prenups over the past three years. This likely has a lot to do with the fact that couples are waiting until they are older to get married, so there are a lot more assets on the line. For many couples, prenups make good sense and they should discuss money prior to marriage. They serve as a good way to protect your personal real estate, preserve your inheritance rights and predetermine how you want to handle the terms of divorce should the marriage wind up dissolving. Whether you found this page because you are contemplating drafting a prenuptial agreement prior to your upcoming marriage or because you are concerned about the prenup you already have during your looming divorce, there are a few little-known facts you should know about prenuptial agreements in Washington State. Custody is a highly contentious topic during many divorces, as is child support. People think they may preempt custody battles and protect their parenting and visitation rights by including details in their prenup about how they will handle the children. But these types of terms are simply not enforceable in the state of Washington. State laws do not allow child support and custody to be determined by a prenuptial agreement. The courts are the ultimate authority when it comes to these matters. The courts’ aim is to ensure that custody arrangements are made in the best interests of the child, not necessarily what is best for the parents when they devised their prenup years ago. Likewise, child support orders aren’t made arbitrarily; they are made by factoring in both parties’ incomes and using the state’s specific financial guidelines. 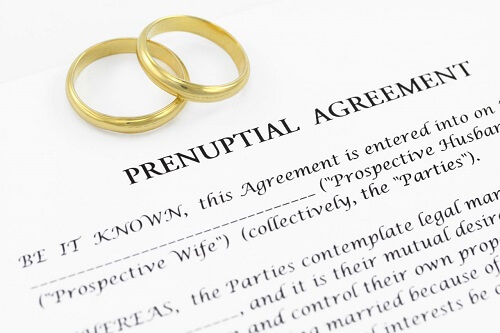 Prenuptial agreements are highly detailed, specifically formatted legal documents. They are neither easy nor simple to draft. They have to address the nitty gritty of multiple areas of a couple’s marriage and divorce. And no two prenups are alike because each couple’s assets and points of interest are different. Generic online templates often don’t cut it. They are a dime a dozen. DIY-minded couples may think they are saving a few dollars by using a generic template, but it often winds up biting them in the backside because fill-in-the-blank documents rarely stand up to the courts’ scrutiny. We’ve seen scores of couples become quickly crestfallen when they realize their prenup is essentially no good in the courts’ eyes. The general public seems to have mixed connotations about prenups. Proponents think they can protect the interest of both parties and prevent heated court battles in the event of divorce; critics say prenups can weaken trust and can hurt a marriage before it even begins. Regardless, a lot of couples, (especially older couples, those with a high net worth and those who have been previously married) want to have a prenup as a safety net – at least for period of time. What a lot of people aren’t aware of is that you can put an expiration date, so to speak, on your prenup. You can stipulate as part of your agreement that the prenup no longer will be valid after a certain period. For instance, your agreement may include something along the lines of: “After 10 years from the date of marriage, this agreement is of no further notice.” This is called a sunset clause. Quite candidly, sunset clauses allow wealthier spouses to ensure they aren’t being married for money. Should the marriage prove true and enduring, the prenup will expire automatically. After the prenup expires, or anytime during the marriage for that matter, the couple can opt to devise a new agreement with different terms. While courts will not enforce terms regarding child support or child custody in a prenup, they may enforce terms regarding alimony. Washington laws provide that couples can use a prenuptial agreement to decide issues about alimony. Couples can use a prenup to waive rights to alimony or to establish terms such as the type, amount and duration of support. However, if the prenup isn’t drafted correctly, if the terms of the prenup highly favor one spouse or if the couple didn’t stick to the terms during the marriage, the courts may decide not to enforce the alimony agreement. If you have questions about prenuptial agreements or need help with creating, modifying or enforcing one, call the Law Office of Molly B. Kenny in Washington. Our firm can assist with all aspects of prenups. Call us today at (425) 460-0550 to schedule a consultation or fill out our online contact form.